You will find the Hammer Stahl American Clad 10 1/2 inch Fry Pan to be an ideal pan for pan-frying lamb chops, wilting some leafy greens, or throwing together a quick stir-fry. The curved sides allow you to toss and flip foods with ease. 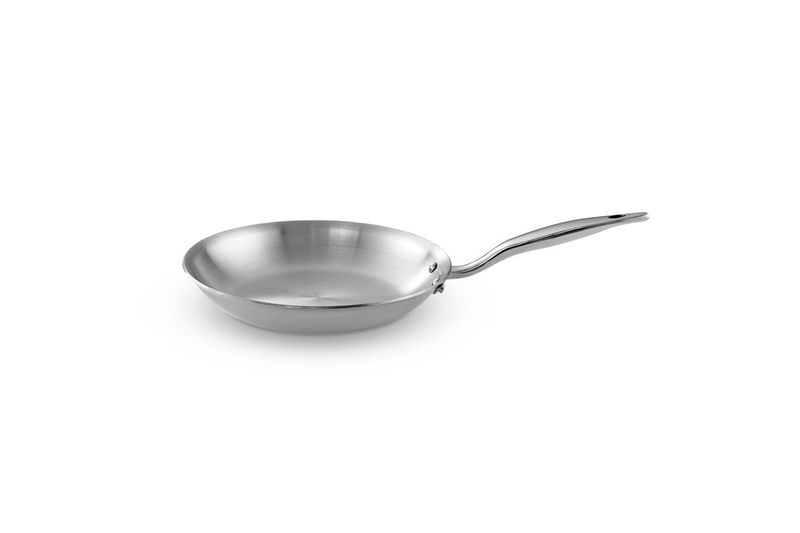 Use this stainless fry pan on a wide range of cook tops, including induction. The 7-ply construction is used throughout, not just on the bottom, so your food will cook evenly and efficiently with less chance of burning. Hammer Stahl cookware is oven safe at high temperatures, is scratch and dent resistant, heats evenly, and is induction ready. Not only does this cookware use the best materials available, it's also a joy to cook with. Durable, effective, and beautiful for a lifetime of great cooking. 7-ply construction with 3 layers of aluminum and 4 layers of stainless steel. Surgical-grade stainless steel with titanium. Fully clad on all sides to ensure even and efficient cooking. 300 series stainless steel exterior ensures greater durability and a lasting shine. Stay cool hollow handles are engineered with an innovative ergonomic design. Safe for all stovetops, including induction. Oven safe up to 500° F.
Dimensions: 10½ inches diameter x 1¾ inches high. Lifetime guarantee with proper use and care. Proudly crafted in Clarksville, TN, USA. MetroKitchen.com recommends before the first use, wash pans of any remaining manufacturing oils. To do this, wash the pan with 3 parts water to 1 part vinegar. Before cooking, preheat the pan for 1-2 minutes, to ensure a stable heat throughout the surface. Never use an aerosol cooking spray as this can cause a sticky film to build up on the pan which could affect the performance of the cookware. We recommend hand washing to prolong the lifetime of the pan. Always use hot, soapy water and a soft sponge to clean your pan. Never use an abrasive brush or sponge while cleaning. After washing, thoroughly dry the pan to prevent water spots from forming. You can restore the shine of American Clad Cookware by using a stainless steel polishing cleanser. American Clad Cookware by Hammer Stahl is crafted using the highest standards. Every part of their stainless steel cookware is warranted to be free of defects in material and workmanship for the lifetime of the purchaser.